Wouldn’t it be great if you can turn ordinary pasta dishes to culinary works of art with magic? Believe it or not, you don’t need sorcery to upgrade your dishes, all you need is to drizzle pasta with truffle oil. Truffles are often used in restaurants and high-class dining establishments. A few pieces of shaved truffles can make your dishes truly unforgettable - in a good way. However, everyone knows that truffles are extremely expensive, especially if you’re buying it outside of growing season. So what’s a hobby chef (or queen of the castle) to do if they want the magic of truffle in their everyday cooking? Substitute it with truffle oil. Truffle oil is basically oil infused with the flavor and aroma of truffles. It’s a great alternative for people who want to incorporate truffles into their daily meals but don’t have the means to buy and search for real, fresh truffles all-year round. You may see a lot of hate towards truffle oil, especially from people who consider themselves experts on all things truffle. This is because, for most connoisseurs, truffle oil is fake. This is both true and false. Admittedly, a lot of truffle oil brands are synthetic, meaning there’s no actual truffle content in the oil. These truffle oil brands create their truffle oils in a lab, from synthetic chemicals that mimic the flavor and aroma of truffles. However, some truffle oil brands are genuine, where truffles are soaked in oil for a long period of time. If you want to make sure your truffle oil contains real truffles, look for those with truffle bits on them. In today’s post, we share some of our favorite recipes with truffle oil and pasta as the staple ingredients. We’ve included both easy, on-the-go recipes and complex, luxury ones so we have something for you no matter what you’re in the mood for. White truffle oil has a more delicate flavor, which is best paired with dishes that have delicate flavors as well. If your dish has ingredients with gentle and subtle flavors, you want truffle oil to compliment it, not overpower it. 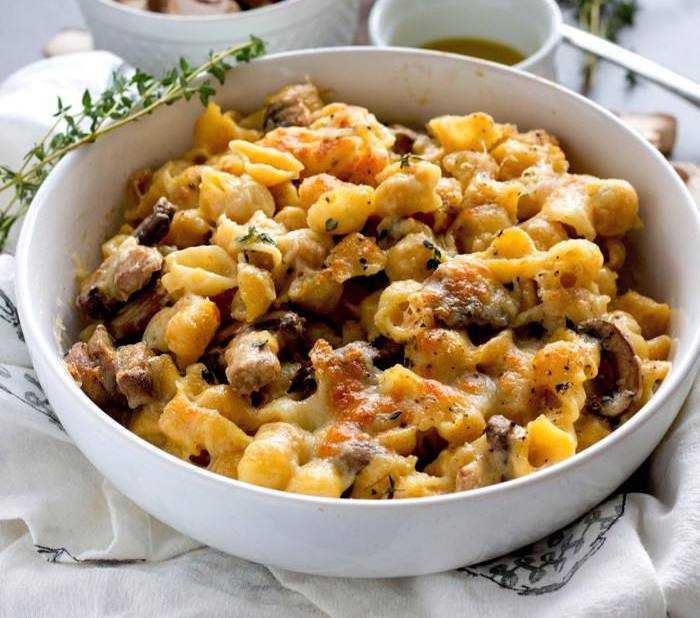 When it comes to white truffle oil recipes pasta is a common sight because noodles themselves don’t have flavor and instead absorb the flavor of any sauce it is cooked with. Below are just some white truffle oil pasta recipes you can try that benefit from a good drizzling of white truffle oil. 1. In a skillet, cook the olive oil over medium heat. 2. Stir in thyme and mushroom. Cook for 5 minutes, stirring occasionally until the mushroom starts to soften. 3. Add water, milk and pasta. Increase heat settings to high and allow the ingredients to boil until the noodles soften. 4. Reduce heat and add 2 tablespoons of flour. Stir until the flour is thoroughly incorporated with the other ingredients. 5. Add cheese, truffle oil, salt, and pepper. You can adjust these four ingredients, adding more or less according to your preference. 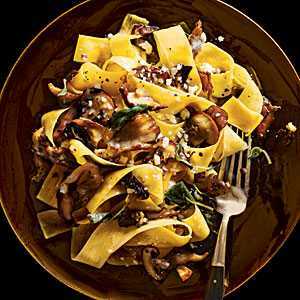 This mushroom truffle oil pasta recipe yields 4 servings. If the sauce is on the thin side, just add more flour to thicken it. Also, once the mac and cheese is done, you can place the saucepan in the oven to broil it. 1. In a food processor, combine the 3 types of flour, eggs, olive oil and salt. Pulse until all the ingredients are thoroughly combined. 2. Transfer the dough to a flat, clean work surface and start kneading it by hand until smooth. Cover the dough with plastic wrap and let it sit for 20 minutes. 3. Sprinkle some flour on a flat, clean work surface and place the dough over it. Roll the dough until it is ⅛ inch in thickness. Cut the dough out in irregular triangle shapes. 4. Cook pasta in a pot with salted water for 1-2 minutes. Drain the pasta and set aside. 5. In a separate bowl, combine hot water and dried porcini. Set aside for 10 minutes until the water is infused with the flavor of porcini mushrooms. Strain to get around ½ cup of porcini broth. 6. In a saute pan over medium heat, cook the olive oil until hot. 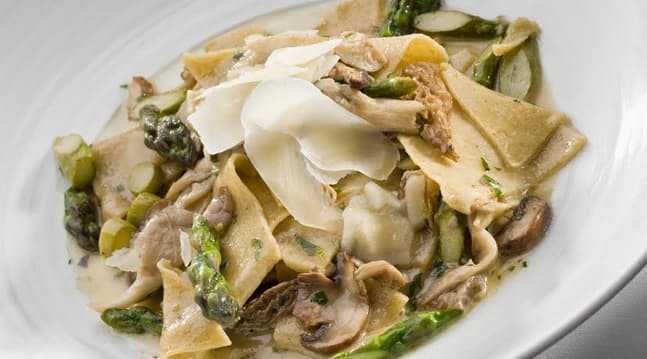 Stir in the mushrooms and asparagus and cook until the ingredients are tender. 7. Add garlic. Cook for 1-2 minutes or until fragrant. 8. Pour wine over the pan and cook until the wine has been absorbed by the other ingredients. Add the porcini broth. Cook until it starts to simmer. 9. Allow to simmer until the liquid evaporates to half its original volume. This will take around 4-5 minutes. 10. Add the butter. Mix until the butter is melted and combined with the other ingredients. 11. Add the cooked pasta. Toss to incorporate the pasta with the sauce. 12. Season the pasta with salt and pepper. 13. Garnish the pasta with truffle oil and parmesan cheese. This recipe yields 4 servings of Irregular Farro Pasta. 1. Before preparing this recipe, soak the cashews in cold water overnight. Drain cashews when you’re ready to cook the pasta, and discard the soaking water. 2. In a food processor, combine 1½ cups of water and cashew. Pulse on high speed until the cashews become a smooth puree free of lumps. 3. Stir in yeast, dried thyme, salt, pepper and truffle oil. Stir until all ingredients are combined. 4. Prepare your fettuccine pasta according to the package instructions. 5. Add the pasta to the sauce mixture. Toss until the pasta is well incorporated with the sauce. 6. Top with basil as garnish. This recipe yields 4-6 servings of pasta. The pureed cashews make for a healthier alternative to the usual cream sauce. 1. 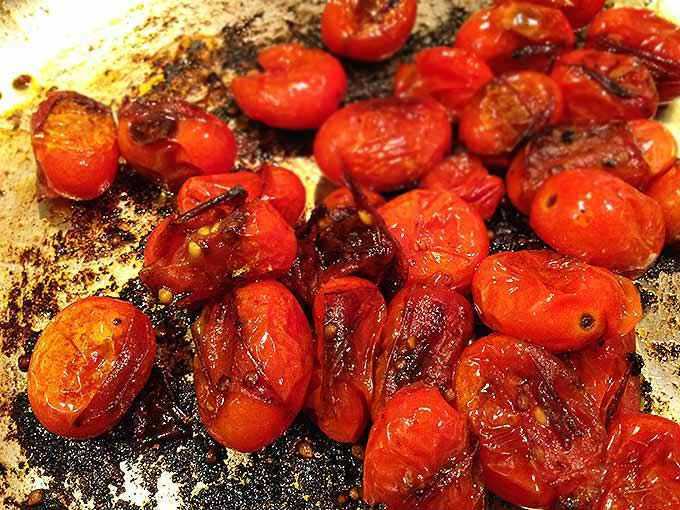 Cook the grape tomatoes in olive oil in a skillet over high-medium heat. Cook for 5-8 minutes, or until the tomatoes blister. 2. Remove the skillet from heat, season with salt and pepper. Set aside. 3. Cook the pasta bowties according to the instructions on the package. Drain and set aside. 4. In a glass bowl, combine the drained pasta bowties, chopped fresh basil, white truffle oil, garlic, red wine vinegar, salt and pepper. Toss all the ingredients together. 5. Place the blistered tomatoes on top of the pasta salad. This recipe yields 6 servings of pasta salad. 1. In a large skillet, heat the olive oil over medium-high heat. Cook chicken in the skillet for around 5 minutes or until it turns golden brown. 2. Add the zucchini and cook for 2 minutes, or until the zucchini starts to soften. 3. Reduce the heat and add the porcini mushrooms. Cover the skillet and cook for another 5 minutes. The chicken should be thoroughly cooked. 4. Cook the cheese ravioli according to package instructions. Place pasta in a deep plate. 5. Toss the pasta with the chicken and sauce. Sprinkle the basil and truffle oil. This recipe yields 4 servings of porcini chicken with cheese ravioli. 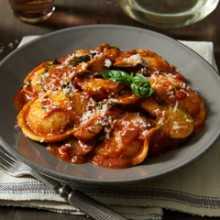 You can serve the dish as is, or add more grated cheese and basil on top if desired. 1. In a saute pan, heat oil over medium heat. Saute the garlic and shallots until cooked. Season with a pinch of salt and pepper. 2. Add tomatoes, saute for around 1 minute. 3. Add shrimp and mussels. Season with more salt and pepper. Saute for another 2 minutes. 4. Pour the wine and cover with a lid. Allow the ingredients to cook for around 4-6 minutes or until the mussel shells open. 5. Stir in green onions and crabmeat. Season with even more salt and pepper. Saute for another minute. 6. In a separate pot, cook the pasta, following the directions on the package. Drain and add to the skillet. 7. Toss the pasta and seafood together until combined with the heat still on for around one minute. 8. Add cheese and basil. Toss the pasta some more to incorporate the two latest ingredients. 9. Transfer to a serving dish. Drizzle some white truffle oil on top as garnish. The recipe yields 4-6 servings of seafood pasta. 1. Boil some salted water in a large pot for the penne. 2. Clean the lobster tail and remove the meat from its shell. Cut the lobster meat into small chunks. 3. In a large pan, melt the butter over medium high heat. 4. Add the shallots. Saute for 2-3 minutes or until the shallots are translucent and soft. 5. Add the lobster meat and white wine. Cook for 2-3 more minutes, or until the lobster meat becomes opaque. 6. Stir in the cream, season to taste with salt and ground pepper, remove from heat and cover to keep warm. 7. Cook the pasta, following the directions on the package. Strain and add to pan with other ingredients. Toss lightly to incorporate the pasta with the sauce. 8. Drizzle some white truffle oil on top. Add parsley and toss to incorporate. 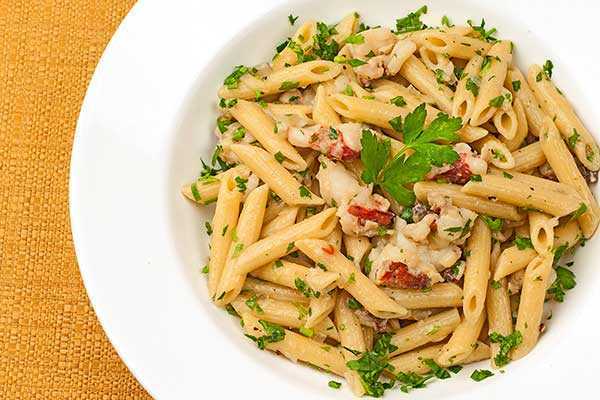 This recipe yields 2 servings of lobster penne, perfect for an intimate dinner for two. 16 ounces shrimp, deveined and peeled. 1. Boil water in a large pot. Cook pasta according to the instructions on the package until al dente. 2. In a large pan, cook butter and olive oil over medium heat. Once oil is hot and butter has melted, add the red peppers and garlic. Cook for 1 minute. 3. Add clams together with the juice. Increase heat to high. Stir in wine and simmer for 2-3 minutes or until the wine evaporates a bit. 4. Add half and half, and the lemon juice. Continue simmering for another 2 minutes. 5. Slowly add the shrimp, making sure it is drenched in sauce. Cover pan and let it simmer for another 2 minutes, or until the shrimp changes to a pink color. 6. Add a pinch of salt to taste. 7. Toss in pasta until it is well incorporated with the sauce. Wait for the pasta to absorb most of the sauce. 8. Transfer the pasta to a serving dish or large platter. Drizzle pasta with white truffle oil on top. 9. Sprinkle chopped parsley to garnish before serving. This recipe yields 4 servings. In lieu of clam juice, you can also use other seafood stock. 2. Place cashews in a small bowl or mug. Pour just enough boiling water to fully submerge the cashews. Set aside. 3. In a pan, heat olive oil over very low heat. Add the onions. Cover the pan and allow the onions to cook for around 45-60 minutes, occasionally stirring the onions to prevent it from sticking to the pan. 4. Slice the squash in half and lengthwise, remove the seeds. Set the squash on a baking sheet and brush lightly with olive oil. Bake inside the oven for around 45 minutes, or until the squash is completely cooked and slightly brown on the surface. 5. Once you've got the onions going, prepare the squash. 6. By the time the squash is done, the onions are most probably caramelized as well. Now it’s time to add garlic to the onions and saute for around 2 minutes, or until fragrant. 7. Increase the heat and add wine. Cook until the edges begin to bubble. Stir the ingredients to prevent any build up on the side and to loosen any onions are stuck on the pan. 8. Once the dish starts to simmer, add soaked cashews and almond milk. 9. Deskin the butternut squash and add it to the mixture. Allow it to simmer while you prepare the pasta. 10. Cook the pasta according to the instructions stated on the package. Drain and set aside. 11. Remove sauce from heat and transfer contents to a blender. Process until sauce achieves a pureed consistency and is free of lumps. 12. Return the sauce back to the pan and reheat for 1-2 minutes. 13. Remove from heat. Drizzle white truffle oil. 14. Toss pasta into the sauce until well incorporated. Transfer to a serving dish. 15. Top pasta with chopped sage as garnish and serve. This recipe yields 4-6 servings. If you want the baked version of this dish, just add 1 more cup of water to the sauce, place the dish on a square baking pan, top with breadcrumbs and bake in the oven for around 45 minutes. 1. Boil salted water in a pot for the pasta. Cook pasta according to package instructions. Drain the pasta, and set aside. 2. In a saucepan, heat vegetable oil over medium-high heat. Add pasta slowly. Cook until golden brown. 4. Season pasta with white truffle oil, salt, pepper and dry oregano. 5. Serve pasta with a small bowl of marinara sauce for dipping. This recipe yields 4 servings of bowtie pasta cooked in wonton style. 1. Using an electric mixer, combine the flour, eggs, salt and white truffle oil. Process until you get a crumbly and sandy dough. 2. Spread the dough out on a flat, clean working surface and knead it, pressing the crumbly bits against the dough to incorporate it. 3. Place the dough inside a ziplock bag and place inside the refrigerator for around 2 hours. 4. Remove the dough from the refrigerator. Cut the dough into four pieces, carefully placing the 3 pieces back into the ziplock bag while you work on the first piece. 5. Roll the dough out and process it through a pasta roller. Gradually thin the dough out. Go as thin as you can go. 6. Finely mince the thyme leaves and sprinkle it on top of the dough. Fold the dough onto itself and process it through the roller once more to evenly distribute the thyme. 7. You can make do without a pasta roller, just roll it out using a rolling pin to as thin as you can get it. 8. Do the same to the other 3 pieces of dough, until you have 4 pieces of rolled out, thin dough. 9. Cut the dough into rectangular strips, with the length twice the size of its width. 11. Strain the noodles and transfer to a serving dish. 12. Drizzle more white truffle oil on top. This recipe yields 4 servings of pasta. You can serve the noodles with some grated parmesan cheese, black pepper and thyme. The flavor of black truffle oil is stronger and more robust. If your black truffle oil recipes pasta dishes includes flavorful ingredients, a drizzle of black truffle oil is better because the flavor won’t go unnoticed, no matter what ingredient combination you have. 1. In a saucepan, heat the olive oil and butter over medium heat. 2. Once the butter has melted, start cooking the garlic without letting it brown. 3. Stir in the white wine, onion powder and half and half. Stir to combine all ingredients. 4. Turn down the heat and allow the ingredients to simmer for around 5 minutes, stirring continuously. 5. Remove from heat and add the parmesan and havarti cheeses. Stir to encourage the cheeses to melt. Drizzle black truffle oil on the sauce. 6. Keep stirring the sauce to help melt the cheese until the sauce cools to lukewarm. Transfer the sauce to a blender and process until smooth and creamy. The cheeses should be well incorporated with the rest of the ingredients. 7. Add a pinch of salt and some pepper as seasoning. 8. Cook the pasta according to the instructions on the package. Drain. 9. Transfer pasta to a serving dish. Pour sauce over pasta. Toss to combine the pasta with the sauce. You may drizzle more black truffle oil if you desire. This recipe yields 6 servings. You can use any pasta with this cheese sauce recipe. Sprinkle grated cheese and herbs on top as garnish for added flavor. 1. Boil salted water in a pot. Cook the pasta according to the instructions on the package. 2. In a skillet, heat the olive oil and butter over medium heat. Cook the shallots for around 1 minute or until the shallots are somewhat softened. 3. Add garlic and cook for another minute, or until fragrant. 4. Add the mushrooms. Toss to fully coat the mushrooms with shallots, garlic and oil. Cook for another 2-3 minutes, or until the mushrooms start to brown. 6. Stir in scallions and cream. Turn down heat and allow to simmer. 7. Drain pasta and add to the cream sauce. Toss carefully to coat the pasta evenly with sauce. Sprinkle salt, pepper and black truffle oil, adjusting the measurements to your liking. 8. Transfer the pasta to a serving dish. Sprinkle chopped parsley to garnish. This black truffle oil pasta recipe yields 2 servings of pasta. 2. Boil salted water in a pot. Cook the macaroni for around 7 minutes, or until al dente. Strain and transfer the noodles to a sheet pan that has been greased with oil. 3. In another pot, melt half of the butter over low heat. Once the butter is melted, add the flour. 4. Cook for another 4 minutes, stirring occasionally. Once the flour is dissolved with the butter, stir in the onion, bay leaf, chopped black truffles and milk. Allow the sauce to simmer for 10 more minutes. 5. Remove the bay leaf and onion. 6. Remove from heat and add the white cheddar, Gruyere and parmesan. Season with a bit of salt and pepper according to your preference. 7. Fold in the cooked macaroni. Toss to fully coat the noodles with sauce. 8. In a saute pan, combine the remaining half of butter with breadcrumbs and parsley. Heat until the butter has melted. Remove from heat and pour breadcrumb mixture over the macaroni. 9. Place macaroni inside the oven and bake for around 30 minutes. 10. Set macaroni aside to cool for 5-8 minutes. 11. Garnish with shaved black truffles. Serve. 1. In a skillet, combine the onion, beef, garlic and mushrooms. Cook until the beef turns brown. Add the marinara sauce. 2. Allow the sauce to boil for around 15 minutes so the beef can absorb the different flavors. 3. Boil salted water in a pot. 4. Peel the rutabagas, cutting off the ends. Use a spiral machine to turn the rutabagas into noodle strands. 5. Boil the rutabaga strands for around 8 minutes. Drain rutabaga noodles and transfer to a serving dish. Drizzle black truffle oil on top. Season with pinch of salt. 6. Pour sauce over the noodles. Use parsley as garnish. 1. Mince the onions and scallions. Set aside. 2. Boil salted water in a pot. 3. Take 2 8-ounce ramekins and grease the sides and bottom with butter. 4. In a saucepan, melt 2 tablespoons of butter. Add onions and cook until translucent. 5. Add 2 tablespoons flour. Combine with the rest of the ingredients and cook until the sauce browns a little. 6. Add the heavy cream. Allow the cream to simmer until it thickens to a sauce-like consistency. 7. Add the grated cheese. Turn down the heat and cook until the sauce thickens more because of the melting cheese. Add salt and pepper as needed. 8. Cook the linguine in the pot of salted water until al dente. Drain and toss noodles into the sauce. 9. Add the scallions. Toss all the ingredients together. Remove from heat and spoon into the prepared ramekins. 10. Press down into the center of the ramekin. 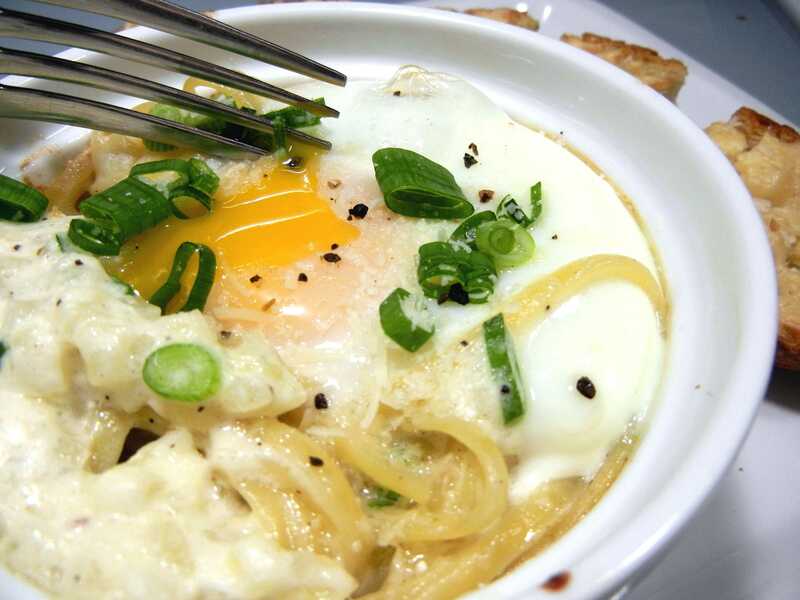 You may even nudge the center noodles out of the way. In the center of the ramekin, pour one whole egg. 11. Place the ramekins inside the oven and bake for around 10 minutes at 350°F. 12. As a nice side dish, you can cut off a slice of French bread, and spread butter on it. Sprinkle grated cheese on top and bake it in the oven at the same time you bake your ramekins. 13. Remove from oven. Sprinkle some black truffle oil before serving. 2. In a saucepan, combine the flour, whole milk, 3 tablespoons truffle butter, Gruyere, white cheddar, brie, and nutmeg. Cook over very low heat until the truffle butter and cheeses are melted, and all the ingredients are combined. 3. Remove from heat and transfer cheese sauce to a large bowl. 4. Boil some salted water in a large pot. Cook rigatoni until al dente. Drain and transfer rigatoni to large bowl with the cheese sauce. 5. Add heavy cream and toss to fully coat the pasta with cream. 6. Take 4 gratin dishes and divide the pasta evenly among the four dishes. 7. In a small bowl, combine the remaining truffle butter, cheese and breadcrumbs until fully incorporated. Spoon the mixture on top of the gratin dishes, over the noodles. 8. Bake for around 20 minutes or until the breadcrumbs take on a nice golden brown color. 9. Drizzle pasta with black truffle oil before serving. 1. Preheat a large pan to medium-high heat. 2. Add the ground lamb, separating large chunks using a wooden spoon. 3. Sprinkle a bit of garlic powder on top. Cook the ground lamb until the meat turns brown. 4. Add onion. Turn down heat and cook for another 5 minutes, stirring occasionally, until the onion is translucent and soft. 5. Stir in tomato soup, tomato paste, ketchup and spinach. Cook for another 5 minutes, stirring constantly to blend all ingredients. 6. Cut the cream cheese into smaller cubes and add to mixture. Stir carefully, allowing the cream cheese to melt and incorporate with the other ingredients. Taste the sauce and season according to your preference with the salt, pepper, vinegar and truffle oil. 7. Boil salted water in a pot. Cook the egg noodles according to the instructions on the package. Drain and add to the sauce mixture. 8. Toss the noodles to coat it thoroughly in sauce. Remove from heat and allow to stand for 10 minutes so the pasta will absorb the different flavors in the sauce. 2. Boil some salted water in a pot. Cook pasta according to instructions on the package, except slightly undercooked. Drain and transfer to a dish. Drizzle black truffle oil on top and set aside. 3. In a saucepan, combine the olive oil, shallots, garlic and bacon. Cook for around 10 minutes over low heat. 4. Add flour and turn up the heat. Cook for another 2 minutes, constantly stirring. 5. Add heavy cream and continue cooking until the sauce starts to boil. Once boiling turn down the heat and allow the sauce to simmer for around 10 minutes. 6. Add the basil, thyme, salt and pepper. 7. Slowly stir in the cheddar cheese in small batches, stirring well after each addition. Repeat until all the cheese has been blended and melted. 8. Toss in the pasta carefully until it is thoroughly coated with the sauce. 9. Add in the herbs and seasonings. Stir in 3 cups of the extra-sharp cheddar until smooth. 10. Divide the pasta among 2-3 baking dishes. Top each dish with pecans and grated cheese. 11. Bake the pasta for around 10 to 15 minutes, or until the top is slightly brown. This recipe yields 4 servings of pasta. 1. Boil salted water in a large pot. 2. Cook the capellini pasta for 6-7 minute, or until al dente. 3. Toss the peas in 1 minute before draining the pasta, so as not to overcook it. 4. Drain and transfer to a serving platter. 5. In a small bowl, combine the chopped black truffles, champagne vinegar, minced shallots and black truffle oil. Mix to combine the ingredients. 6. Pour the truffle vinaigrette on top of the pasta. Top with chives as garnish. 7. Taste and adjust seasonings to your preference before serving. The following recipes are made with either white or black truffle oil. You can interchange the two truffle oils, as long as you taste the dish and adjust the measurements according to your taste. 1. Boil salted water in a large pot. Cook the pasta until al dente. 2. Drain the water and transfer pasta to a serving dish. Drizzle olive oil and toss to prevent the pasta from getting sticky. 3. In a separate pan, heat olive oil. Once oil is hot enough, add garlic and onions and saute until onions are caramelized. Turn off heat and set aside. 4. 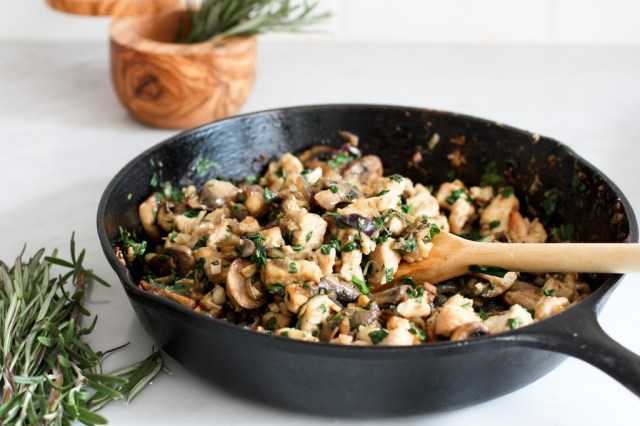 Using the same pan, heat olive oil and saute the mushrooms. Season with salt, pepper and thyme. Cook until the mushrooms are slightly golden in color. Set aside. 5. Cut the squash or pumpkin into smaller pieces and place in a greased baking sheet. Spoon some water on the tray just to add moisture and bake the squash for 45 minutes at 375 degrees F, or until the squash softens. 6. If you’re using frozen pureed pumpkin or squash, skip the previous step and just allow it to thaw before moving on to the next step. 7. Place the softened squash or pumpkin in your food processor. Add the caramelized onion and garlic, truffle oil, more thyme, and almond milk. Pulse until creamy and smooth. 8. Add salt and pepper as needed to taste. Process until well combined. 9. In a frying pan, combine the squash mixture, pasta, and mushrooms. Add around ¼ cup of hot water for the sauce. If the sauce is too thick and you want more, add another ¼ cup of hot water. Just make sure the sauce isn’t runny. 10. Toss the ingredients together to incorporate the pasta with the other ingredients. Season according to your preferences, adding more truffle oil and possibly topping the pasta with cheese if you wish. This recipe yields 4-6 servings. 1. Boil salted water in a large pot. Cook the gnocchi according to the package instructions, except remove the pasta from heat one minute earlier than the recommended time. 2. 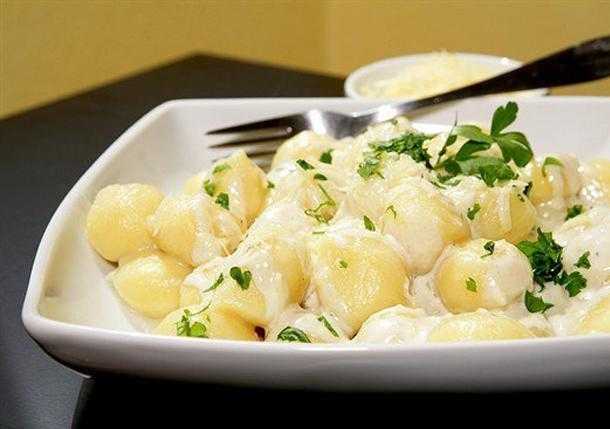 Drain gnocchi. Set aside 1 cup of pasta water for later. 3. In a saucepan, combine the cream, salt, pepper and truffle oil. Cook over medium heat, stirring occasionally. 4. Reduce heat and add the gnocchi and parmesan cheese. Toss the ingredients together and allow the pasta to cook so the cheese melts slowly. 5. If the pasta is a bit on the dry side, you can add pasta water as needed. 6. Transfer the pasta to a serving dish. Sprinkle more truffle oil if needed and top with more grated parmesan cheese before serving. 1. Boil some salted water in a pot. Cook pasta according to the package instructions. 2. Add the peas one minute before the pasta is al dente to blanch it slightly. 3. Drain pasta and transfer the noodles and peas to a bowl. 4. Add lemon juice and olive oil. Season with a bit of salt and pepper as needed. 5. Add lemon zest, pea shoots, parsley and fresh mint. Toss to combine the ingredients. 6. You may add more seasoning, herbs and lemon juice according to your preference. Keep tossing so the pasta fully absorbs the different flavors. 7. Drizzle some truffle oil on top before serving. You may also garnish it with grated goat cheese. This pasta and truffle oil recipe yields 4 servings. 1. Clean porcini mushrooms and place in a bowl. Add a cup of boiling water and cover with a small plate. Allow porcini mushrooms to stand for around 30 minutes before draining. 2. Reserve soaking water for later use. Chop the porcini coarsely. Set aside. 3. Add 1 tablespoon of salt to a pot of boiling water. Cook pasta for around 10 minutes, or according to package instructions. Drain water into a cup, setting it aside for later. Transfer pasta to a bowl. 4. In a skilled, cook shallots, assorted mushrooms and garlic over medium high heat for 5 minutes. 5. Add porcini mushrooms, sherry and a pinch of salt. Cook until the sherry liquid evaporate. 6. Add grated cheese, reserving a few spoonfuls aside for garnishing later. Turn down heat to medium. 7. Toss in the pasta, ¼ cup of mushroom porcini soaking water, ¼ cup of pasta cooking water, cream pepper and chopped sage. Mix until the pasta is thoroughly and evenly covered with sauce. 8. Transfer pasta to a large serving platter. Drizzle truffle oil on top. 9. Top with the remaining grated cheese and sage leaves. 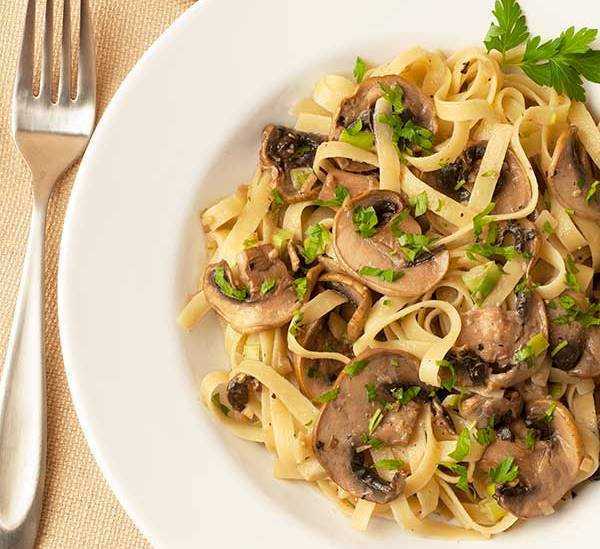 This truffle oil mushroom pasta recipe yields 4 servings. 2. Cut the chicken breast into smaller pieces, around ½ inch. Season liberally with salt and pepper. 3. Heat olive oil in a skillet. Cook the chicken breast over medium heat until cooked through. Transfer to a small bowl. Set aside. 4. Using the same skillet, cook diced onions over medium heat for around 5 minutes or until the onions become translucent. Add the garlic and reduce heat. Continue cooking for another 2 minutes. 5. Stir in the mushrooms, rosemary and a pinch of salt. Reduce heat to low and cook until the mushrooms become tender and release its juices. Stir in the chopped spinach and chicken. 6. Cook until the spinach becomes wilted. Remove from heat and set aside. 7. In a saucepan, start making the bechamel sauce. Melt butter over medium low heat. Once melted, add the flour and cook for 5 more minutes, stirring constantly, until the flour turns a golden brown color. 8. Add the milk one cup at a time, stirring after each addition. Stir in the rosemary and allow the sauce to boil, stirring occasionally. 9. Add the mozzarella. Cook until the cheese is melted and the sauce thickens. 10. Season with white pepper, salt and nutmeg. Let the sauce simmer for a few more minutes to incorporate the different flavors. Remove from heat and set aside. 11. Use 8x12 pan for this recipe. Grease the sides and bottom of the pan with butter. 12. Pour around half a cup of the sauce in the bottom. Spread it using a spatula or wooden spoon. Gently layer fresh pasta sheets on top of the sauce. 13. With a spoon, drop a few dollops of ricotta cheese on top of the pasta sheet. Spread half of the chicken mushroom mixture on top of it. 14. Drizzle more bechamel (½ cup), ¼ cup parmesan cheese, 4 ounces of mozzarella, and lemon zest in that order. Repeat the process one more time, starting from the bechamel sauce, then the pasta sheet, and so on. 15. After the second lemon zest layer, drizzle truffle oil on top. Finish the lasagna with a final layer of pasta sheet. 16. Drizzle any remaining bechamel sauce on top. 17. Garnish with remaining parmesan cheese and rosemary. 18. Cover lasagna with aluminum foil. Bake for around 40 minutes or until the top bubbles. 19. Remove the aluminum foil and bake for another 10 minutes or until the top turns a golden brown color. 20. Allow the lasagna to cool for 10-15 minutes before serving. This recipe yields around 6-8 servings of lasagna. 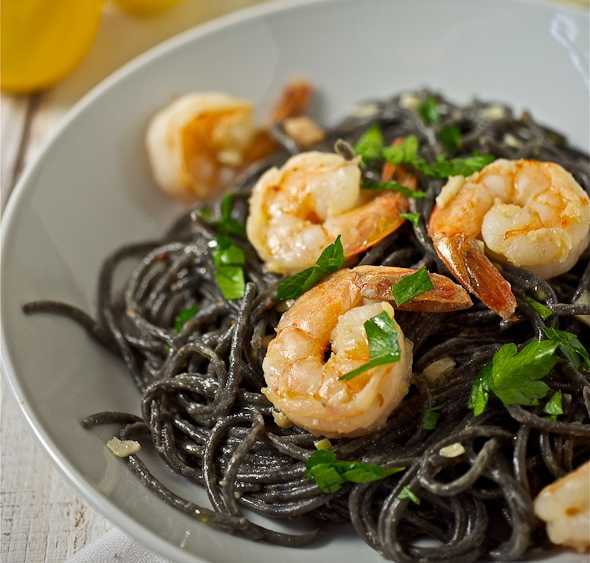 Before you try any of the pasta recipes with truffle oil listed above, here are some tips and tricks that will give you the best tasting results. We show you how to use truffle oil in pasta and how to cook pasta in general. Don’t use truffle oil as a substitute for olive oil in frying or sauteing. The aroma and flavor of truffle oil disappears when cooked in medium to high heat. Truffle oil is almost always used in the end, to be drizzled over the finished pasta dish right before serving. It is usually the last thing you add to complete your truffle oil sauce for pasta dishes. If the recipe calls for using truffle oil in a skillet or frying pan, make sure to use it over low heat. Placing oil in pasta water is the traditional way of preventing sticky noodles. However, this is not a great practice, especially if you’re following a truffle oil pasta recipe. The oil will prevent the pasta from fully absorbing the flavors from the sauce. Also, if you’re using truffle oil and still put olive oil in the pasta water, that’s double the amount of oil, making your pasta very greasy and gross. Don’t be shy in putting salt in your boiling pasta. This is the only way to season your pasta early on. 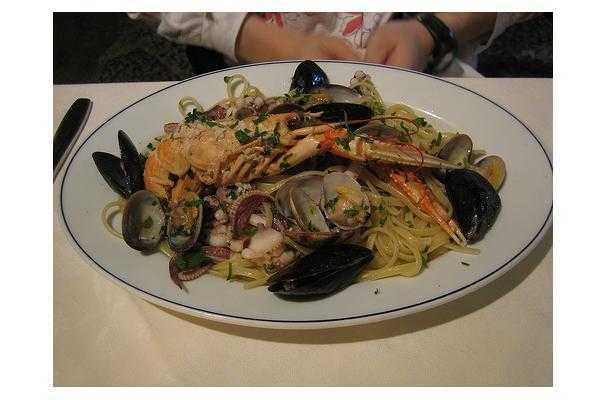 People often only put a pinch of salt in their pasta boiling water, fearing that their pasta will taste really salty. It’s okay to put a teaspoon or two for a large boiling pot. Always be generous with your boiling water. Remember that pasta absorbs the water and some of it evaporates due to high temperature. If you don’t put enough water, the pasta will become undercooked and stick to the pot. If the truffle oil pasta sauce recipe requires you to broil or bake the pasta at the very end, don’t boil your pasta until they’re cooked. Instead, make sure the pasta is undercooked. The baking process at the end will fully cook the pasta. If the pasta is cooked through boiling, then baked later on, you may end up with overcooked, soggy pasta. Always save some of the pasta boiling water for later, in case the sauce ends up too thick and you need to thin it out with water. So there you have it, a list of truffle oil recipes pasta lovers would be proud of! 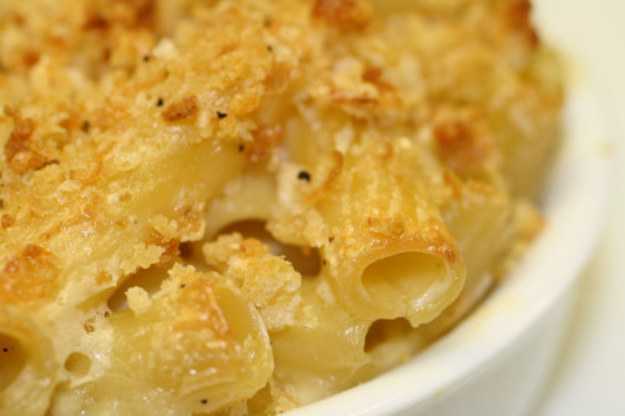 Out of the many recipes featured here, for me nothing beats a yummy, simple mac and cheese. Affordable and easy to make, this simple dish is transformed into a lovely meal with a few drops of truffle oil. The ultimate comfort food for anyone who wants to binge watch some television shows on a comfy sofa. What’s your favorite pasta dish? Have you ever tried truffle oil? If not, then you’re missing out on a lot of things. If pasta is your favorite right now, wait until you try it with truffle oil. You’ll swear it was a gift from the gods! Make it for yourself or impress your friends and family with restaurant-calibre pasta dishes, the difference lies in a few drops of aromatic and flavorful truffle oil.